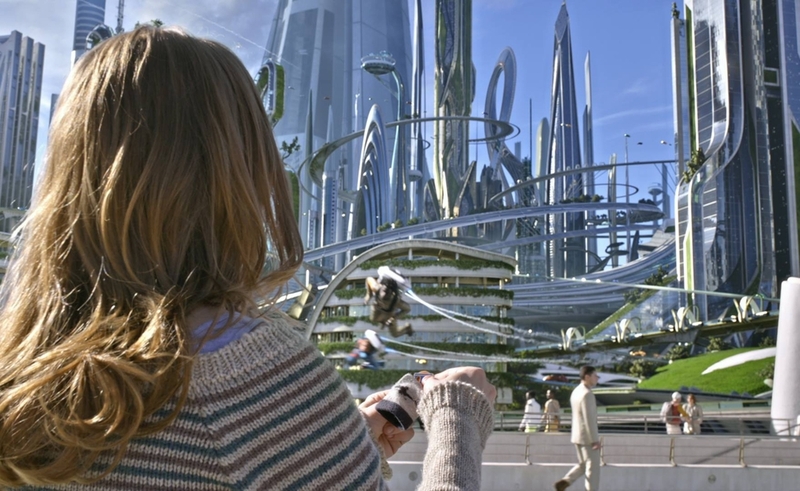 Brad Bird’s Tomorrowland is supposedly a movie about the future. The protagonists wax rhapsodic about the future and try to infuse it with mad science and Spielbergian wonder. The villain kvetches about people’s approach to the future, and tries to shut it down so no one but him and his chosen few will have one. The movie’s visual design embraces a shiny futurism full of gleaming silver-spired cities, floating monorails, personal jetpacks, and dizzying force-field-shaped tiered swimming pools hanging in mid-air. (The future of Tomorrowland is all about different kinds of flying, from flying buttresses to flying bro-jocks to flying cops.) And the inevitable serpent in the garden of Eden, the dark spot in all the promises of future glory, is the suggestion that Earth is heading for apocalypse if mankind doesn’t shape up and start to revere futurism again. But Tomorrowland really isn’t about the future. It’s about nostalgia, and about clinging to an entirely invented past era, where the future felt like a Disney World ride: Specifically, the Carousel Of Progress, with its theme song, “There’s A Great Big Beautiful Tomorrow.” That ditty plays as Tomorrowland opens, establishing a tone of gee-whiz wonder about how great everything will be if humanity just believes in itself. But then there’s that villain, monologuing about how somewhere along the line (due to a McGuffin and his own evil plot, as it turns out), everything changed for the worse. People stopped believing in the future. Presented with warning scenarios about doom and apocalypse, they failed to course-correct on issues like war and the environment, and embraced world collapse as a source of entertainment. This, the villain says, is a new terrible thing. The turn away from excitement about the future, and toward cynicism and dread, is leading the world to despair—which means not fighting the apocalypse anymore, and bringing it on via apathy and helplessness. There’s a germ of a great idea in there somewhere, in the idea that embracing helplessness as an excuse for not acting gets no one anywhere. But the nut of the villain’s argument—that everyone used to love the idea of the future, and then suddenly stopped—doesn’t hold water. The habit of channeling social anxieties as entertainment, or of using the future as an all-purpose bogeyman to drive drama and fear, isn’t a recent historical change. Maybe specifically at the 1964 World’s Fair, where the Carousel Of Progress debuted, or at Disney World and Disneyland, where the ride lived during various eras, there was a feeling that the future was a dazzlingly polished, untarnished place of white jumpsuits, tasty food paste, and endless leisure, with no downsides or tradeoffs. But actual science-fiction films didn’t suddenly take a turn toward grimdark futures and anti-futurism at some point in history. They’ve been embracing catastrophe all along. At best, the earliest, crudest science-fiction films were neutral on the future. 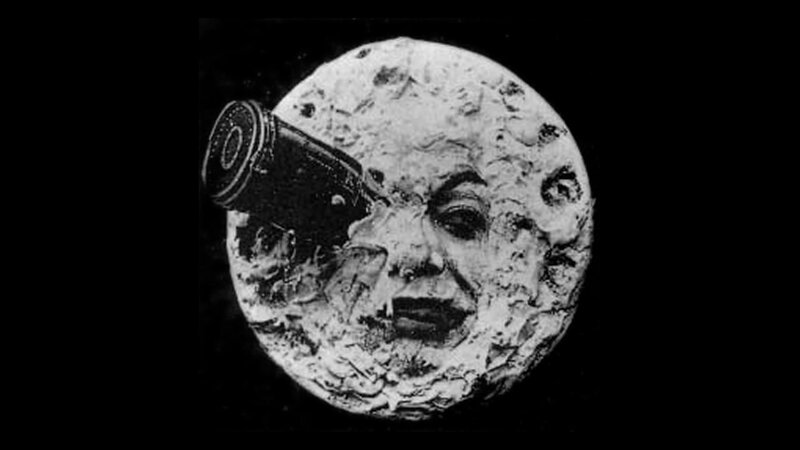 Georges Méliès’ 1902 fantasia “A Trip To The Moon,” widely regarded as the first science-fiction film, is creepy and nightmarish, with its iconic image of the Man In The Moon with a rocket embedded painfully in its eye, its hostile hopping aliens, and its freezing, surrealistic lunar landscape. There are great scientific discoveries and medals for everyone at the end, not to mention Méliès’ favorite trope, lovely ladies at every stop along the way. But “Trip To The Moon” doesn’t find much to admire in the future except the way it can be exploited for weird visions. It’s unknown territory, where strange things can happen and the imagination can run wild. Beyond Méliès, the earliest science-fiction films often adapted literary classics, and inherited their sense of dread and drama: The 1910s saw prominent adaptations of Mary Shelley’s Frankenstein, Robert Louis Stevenson’s Dr. Jekyll And Mr. Hyde, stories about dangerous men meddling with science to selfish and blinkered ends, and bringing misery to other people as a result. Even the more positive 1916 adaptation of Jules Verne’s 20,000 Leagues Under The Sea—like “A Trip To The Moon,” as much about technological innovation and novelty value in the setting—is tinged with worry about what men do with power. Even in its infancy, science-fiction in cinema was about processing anxieties about the present by projecting them into a future where one person with questionable morals might be able to use new technologies to enact his will on the rest of the world. The anxieties continued throughout the 1920s and 1930s, with classics like Metropolis and Things To Come (based on the H.G. Wells book) positing that the world would go through a war-torn, oppressive dystopic era before ending up in a better place. Even comedies like 1924’s The Last Man On Earth (based on another Mary Shelley novel) and 1930’s Just Imagine portrayed dystopic futures—one underpopulated one with all the men but one dead from a disease (move over, Y: The Last Man), and one overpopulated one where people are assigned numbers and ruled by a repressive, romance-averse bureaucracy. For nearly a decade after a few expensive flops, big-screen science-fiction features were out of vogue, largely replaced in theaters by serials like Flash Gordon and Buck Rogers. But even these stories, the kind of “ray-guns and derring-do” adventures Tomorrowland is partially trying to evoke, took place in politically complicated, war-torn worlds full of villainous tyrants with plots to destroy Earth—specifically, villainous tyrants meant to evoke the gangsters and foreign devils heating up the tabloids of the time. The halcyon 1950s, usually the center of nostalgia for Americans who believe things Used To Be Perfect Back In The Day, were a watershed moment for films terrified about the future. Movies fussed about radiation or scientific experiments creating terrible new threats. (Them!, Tarantula, Godzilla, The Most Dangerous Man Alive, Attack Of The 50 Foot Woman, etc.) Movies processed the Cold War and the Communist Threat in terms of sneaky encroaching aliens, or judgmental ones scolding humanity for its short-sightedness. (Invasion Of The Body Snatchers, The Day The Earth Stood Still, It Came From Outer Space.) Movies processed the space race by tapping into paranoia about extraterrestrial life. 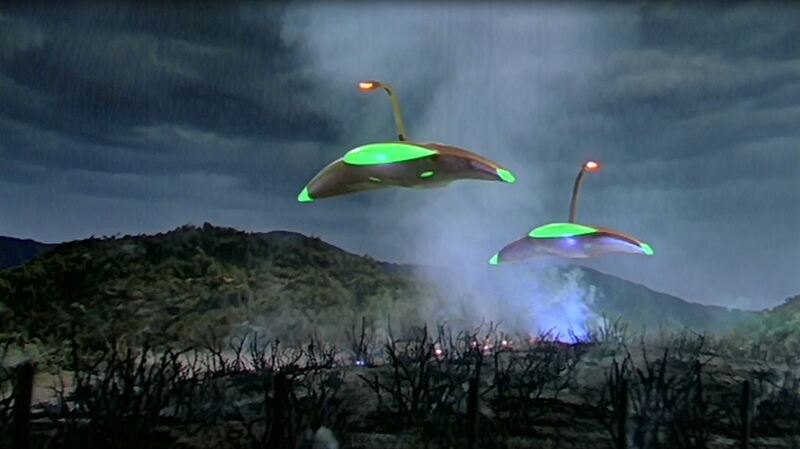 (The Thing From Another World, War Of The Worlds, When Worlds Collide.) Paranoia about the future took a wide and colorful variety of forms: Cinema wasn’t sure whether a cosmic accident would kill us, or deliberate evil from an unfathomable source, or our own determination to once again meddle with forces beyond our control. But no matter what, we were doomed. Our best chance, if we had one, was to keep watching the skies and staying nervous. The 1960s took the paranoia in a more cerebral direction, when the era was concerned with the future at all. (For a while, fantasy versions of the past like Jason And The Argonauts and One Million Years BC were more in vogue, thanks to Ray Harryhausen. And the Godzilla Vs. films poured out throughout the 1960s, but had relatively little to do with the original film’s fear of deadly scientific advances run amuck.) François Truffaut’s Ray Bradbury adaptation Fahrenheit 451, George Pal’s H.G. Wells adaptation The Time Machine, Wolf Rilla’s John Wyndham adaptation Village Of The Damned—the biggest science-fiction titles of the 1960s were all over the place thematically, but they agreed that humanity was still in for some future horror. Not all science-fiction movies have been horror crossovers. In 1968, Stanley Kubrick’s 2001 suggested that even if we can’t trust computers, and are still limited as a species, and beholden to vaster intelligences that rule the cosmos, the future will still be a clean, bright place full of casual space travel that makes the ineffable seem mundane. 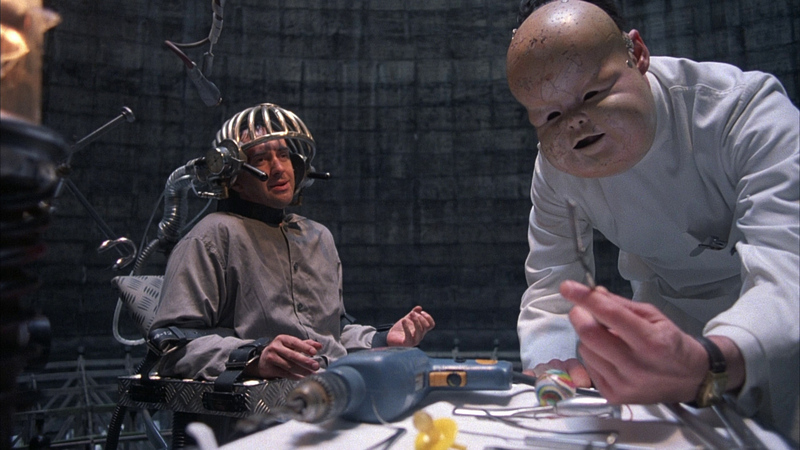 Andrei Tarkovsky’s 1972 Stanislaw Lem adaptation Solaris is one of many films suggesting that technology and even society won’t be barriers in the future, but humanity’s weakness and curiosity might be. But as Keith Phipps’ ongoing Laser Age column has amply illustrated, the science-fiction of the 1970s focused above all on grim paranoia about computers, robots, nuclear war, technological advances, overcrowding, and more. But while the end of that decade and the beginning of the next suggested that discovering aliens might not spell the end of humanity, via Steven Spielberg’s Close Encounters Of The Third Kind and E.T., (and then unconscionable rip-offs like Mac And Me), the focus shifted again. None of these movies are futurist stories. They’re set in the present, and they aren’t about extrapolating what the world might become. Positive futurist films do exist, and they show up more often toward the end of the 1970s and the 1980s: Star Trek: The Motion Picture took America’s most enduring future-positive series to the big screen, once again presenting a beautiful future where the main problems can be solved with communication and creativity. The Last Starfighter kept the scary parts of its future far away from Earth, and turned alien-fighting into a cool pastime for teens instead of a fearsome one for guilty scientists. When the Back To The Future franchise does head into the future, it finds it not so terrible—the fashions are ugly, but the hoverboards are cool, and the only real problems come from a few individual people being jerks. But there are plenty of future-dread movies in the 1980s too—The Terminator, The Road Warrior, Blade Runner, RoboCop, Brazil—along with an ever-more-developed fear that humanity’s destruction will be solely an internal matter, not something that comes from the stars. The villain in Tomorrowland clearly doesn’t approve of modern science-fiction entertainment, which is more obsessed with large-scale apocalypses than ever, from computer takeover of the planet (from The Matrix to Transcendence) to zombie apocalypses to nuclear war. Films as large-scale as 2012 or the new Planet Of The Apes movies, and as small-scale as Perfect Sense or It’s A Disaster, are taking the apocalypse as a given, and usually finding ways to tie it to current events—global climate change, the threat of pandemics, and terrorism among them. But the idea that this fretting over the future is something new, that it’s undermining society, and that we’re all extra-doomed because of what entertainment is doing right now—that’s a bigger, more unexplained flaw in Tomorrowland’s thinking than anything involving its out-of-nowhere killer robots or circular logic. But with relatively few exceptions, science-fiction films have their own language of positivity—not about all the cool stuff we’re gonna invent, and how gosh-wow awesome it’s gonna make our world, but about how change, no matter what form it takes, ultimately won’t kill us all. In all but the most nihilistic or tragic science-fiction films, human ingenuity, resourcefulness, and collaboration make it possible to get the protagonists out of the messes their forebears made. The scientists in “A Trip To The Moon” make it home unscathed to get their medals. Flash Gordon shows up just in time to save Dale Arden from Ming The Merciless. Scientists find a way to destroy the giant ants in Them! and to melt Godzilla down into his component atoms. Ripley out-thinks and out-fights the alien, Wall-E gets the spacefarers back to their polluted Earth and gets them thinking and walking again, Max and Imperator Furiosa take on a corrupt empire of water-withholders with their guns and their determination. The worlds of science fiction may be dark, but more often than not, they’re about people surviving the future, not letting it destroy them. As in all forms of entertainment media, there’s certainly a question of whether it’s really possible to make a utopic science-fiction movie, a film where people made the right choices, cleaned up the environment, stopped manufacturing weapons and fighting among themselves, stopped meddling with clones and genetics and sentient robots and other science-fiction-story threat seeds, and made themselves a happy utopia as a result. The problem with utopias is that if all problems are solved, nothing interesting can happen—and certainly nothing propulsive enough to drive a movie forward. There’s a reason the futurism Tomorrowland suggests isn’t the core of humanity’s entertainment world, and it has nothing to do with a malevolent invention beaming misery-rays into the world. It’s because humanity has always told itself stories to explain its past and present, and to warn itself about the future. That isn’t a bad thing. And no matter what Tomorrowland says, it isn’t the only thing standing in the way of jetpacks and hover-pools. If anything, all these dark visions of the future are how we warn ourselves about the choices we’re making. They’re serving a more useful purpose than blind, upbeat positivism. They’re showing the roads we shouldn’t take. And that’s just as important as highlighting the roads we most want to follow.